•Adelee & Gentry – 7 p.m., June 27, Melvin Miller Park. Rainsite is Urbana University. •Phil Dirt and the Dozers – 7 p.m. July 4, Grimes Field. Rainsite is a Grimes Field hangar. Featured sponsors are The Peoples Savings Bank and the Champaign County Memorial Foundation. •Daniel Dye and the Miller Road Band – 3 p.m. July 18, Downtown Urbana during Art Affair on the Square. •The Muleskinners – 7 p.m. July 25, at Melvin Miller Park. Rainsite is Urbana University. •Hidden Assets – 6 p.m. Aug. 16, Harmon Park, St. Paris. Rainsite is St. Paris United Methodist Church. •The Fountainaires – 6 p.m. Aug. 23, Harmon Park, St. Paris. Rainsite is St. Paris United Methodist Church. Series sponsors are the Champaign County Memorial Foundation, Fonda Lou Eaton, Brett and Heather Gilbert, the Charles F. Johnson Family, Johnson Welded Products, The Medicine Shoppe and The Peoples Savings Bank. The following information about the groups was provided by the Champaign County Arts Council. Take a listen to cuts like “Beautiful Disaster” or “Thunderstorms” from their full-length album, Nice To Meet You…, and you will understand why the sister duo Adelee & Gentry is quickly developing a reputation as one of the fastest rising acts in music today. “A friend came over and showed me a few chords on my grandpa’s guitar. From then on, playing was an everyday thing. I was always playing.” Adelee Gates was 10. Gentry, her younger sister, had to be coaxed into the spotlight. But just like Adelee, once she got a taste of it she was hooked. Music has been coming out of the Gates family household for some time. Growing up the Gates girls were always around music. Adelee & Gentry’s father, James, played drums and some bass. He built a basement studio in which the sisters would later take up residence. One year he got them a 24 track recorder for Christmas on which they recorded their demo CD, Beginnings. The duo either wrote or co-wrote every song on Nice To Meet You….Tracks like “Sweet Memory” and “Dear Boy” are imbued with passion and personality, and in “Orchard Trees” they write and perform with maturity beyond their years. Waiting for Christmas is the act’s first Christmas album. They’ve re-imagined classics like “Carol of the Bells” and “Angels We Have Heard On High,” alongside the title track original composition. The EP will be released November 6th. America’s premiere “Rock ‘N R’oldies” review (and the most popular vintage rock and roll show in the nation) will help you recapture those wonderful days! With their musical talent, high energy and contagious sense of humor, Phil Dirt & The Dozers will transport you to another time and place … namely, the 50’s, 60’s, and 70’s of Rock and Roll! Imagine hearing The Four Seasons’ Sherry with the original falsetto vocals intact … or the hauntingly beautiful Righteous Brothers’ Unchained Melody or their You’ve Lost That Lovin’ Feeling or the beautiful ballads of Roy Orbison including Pretty Woman and In Dreams. Party on the beach with The Beach Boys and Jan and Dean. And imagine the Platters’ soul-stirring Only You performed with all the scratches and skips found on a well-worn 33 1/3 record, the way The Dozers first learned it! The Phil Dirt Time Machine also stops in the ‘70’s, where you’ll experience some of this decade’s greatest hits including those from the Doobie Brothers, Grand Funk Railroad, The Eagles and even the O’Jays. After recent travels abroad, he still finds that songs about home are easier to write when you’re far away and songs about being far away are easier to write when you’re home. 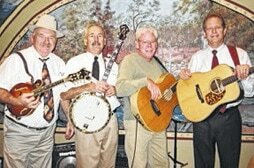 The Muleskinner Band began in 1985 and has performed in a five-state area. Tight harmony, excellent musicianship and just plain fun are a part of every performance. Drawing from a number of influences, The ‘Skinners will deliver toe tappin’ bluegrass, render some old fashioned gospel and have you smiling as you leave their show. No show would be complete without their spin on a few rock classics/r&b and country favorites. The Hidden Assets Band has been playing together for 15 years. The band includes Dale Duke on guitar and vocals, David Burkhart on bass guitar and vocals, Larry Garwood, lead guitar and vocals, and Dave Iddings on drum and vocals. The band plays classic country, rock and blues. The Fountainaires Jazz Band is an outgrowth of the West Central Ohio Community Concert Band. Established in 1995, its volunteer membership is drawn from the Concert Band. The Band’s repertoire is taken from the libraries of Glen Miller, Tommy Dorsey, Count Basie, Frank Sinatra and other greats of the Big Band Era through some of the songs of the ’60s and ’70s. The Fountainaires appear at several concerts and other events in the Logan, Champaign and Union county area throughout the year. The Band is currently under the direction of Myles Bowers.